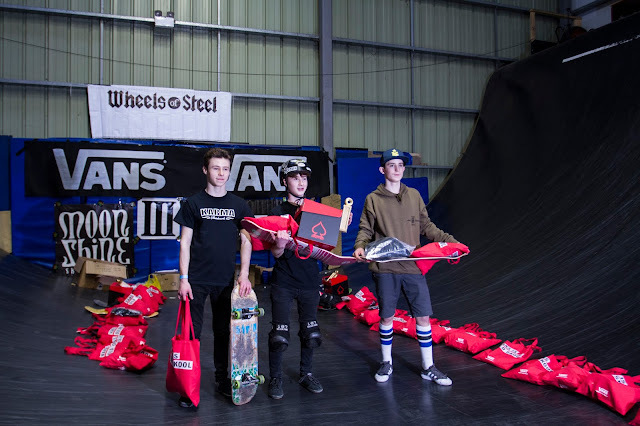 The Wheels of Steel contest went down last weekend at Adrenaline Alley in Corby, and honestly the level of skateboarding was amazing from all categories. This contest, brilliantly put together and run, was the baby of Mat Marlow and marked the first leg of this year’s UK Vert series. 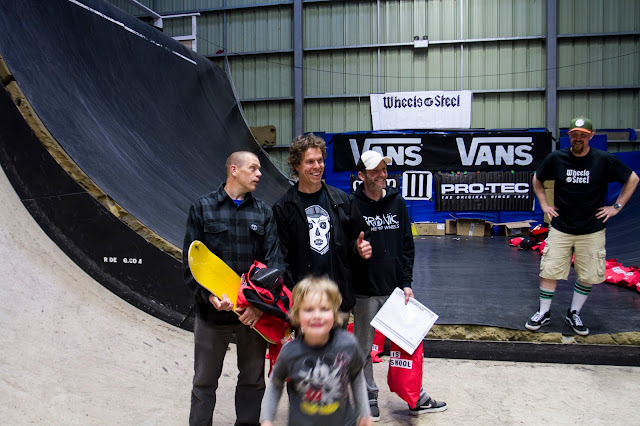 The attendance at this round of the series is the highest that it has ever been, with over 40 participants taking to Corby’s 14ft vert ramp to showcase their skills. The day kicked off with the B group which had to be split into qualifiers due to the high level of people taking part. The top riders from each qualifier then went through to the B group finals and featured some of the country’s best up and coming vert talent. Riders as young as 8 years of age had no fear as they dropped in on this monster of a ramp to perform backside grabs, front side 360 ollies and all manner of stalls on the coping. Each rider had 4 runs with their best three runs being counted towards their overall finishing position. The stand-out riders were Kieran Waterton who took 1st place, Lucio Oliveira with his power and height out of the top of the ramp landing him 2nd place, and Callum Waterton who took 3rd place. 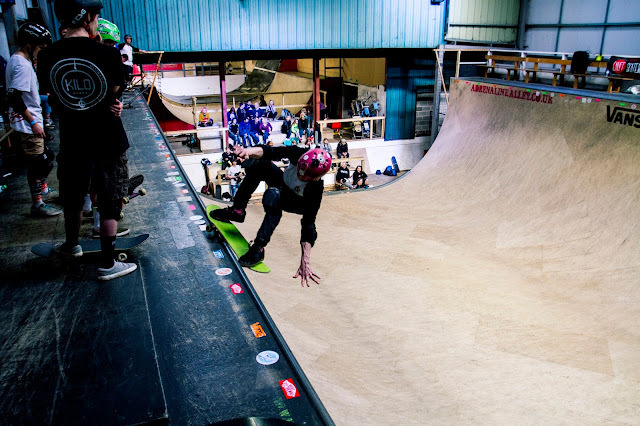 Other notable riders were Eddie Lowe as well as the two young ladies, Freya Brooks and Ellie Waters, who showed it’s not just guys who can skate vert. The next part of the day moved away from the young upstarts of the sport to the elder statesman in the masters category. This featured 9 riders, all pushing to show the youngsters that they still have a thing or two to learn. The skating was fantastic with each rider having their runs before they moved into a timed free-for-all session which allowed them to showcase their very best individual tricks. Jussi Korhonen was really in a class of his own and a real highlight of the day as he threw in huge 540’s, consistent flip grabs and a perfect Cab Heelflip Indy on his way to taking 1st place. Death skateboards’ Dave Allen took 2nd place and Christopher Hudson took 3rd. The last category of the day was the A group, featuring the country’s elite riders. Here the skating really stepped up with everyone being super consistent and putting some really good, high quality runs together. The sense of competition and the passion from everyone was no more evident than when we were spectating from the top of the ramp with every rider keen to get in and give it their absolute best. Again, the contest was made up of individual runs followed by a timed free-for-all session. Stand out tricks were Matthew Carlisle’s huge 540’s, his many flip grab variations and his massive 720. Ex Enuff rider, Alex Griffiths, put down his first 360 varial, and Ethan Doody almost had his ride in revert going into the ramp. 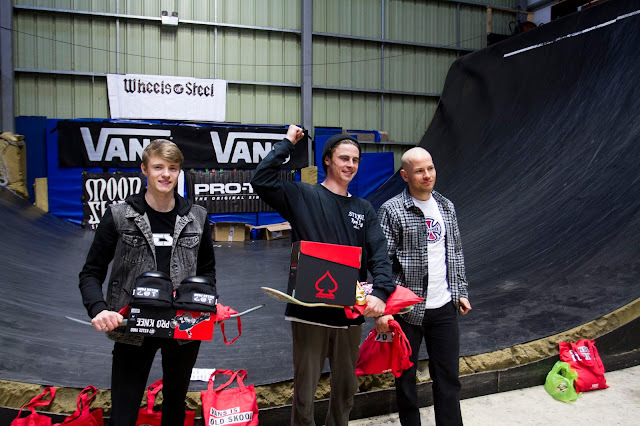 1st place went to Chris Spencer who had a deep bag of tricks and a smooth style to match. 2nd place went to Matthew Carlisle and 3rd to Jim Langran. As far as a bench mark, the Wheels of Steel contest definitely sets the standard for the other legs of the UK Vert series to live up to. Not only was the talent on show impressive but the organisation and smoothness of the event was spot on and we can only put that down to the dedication to the guys running and hosting the event. It was a privilege for Enuff to be involved in this event and to help support the evidently growing vert culture in the UK. Skate boarding’s in a happy place.